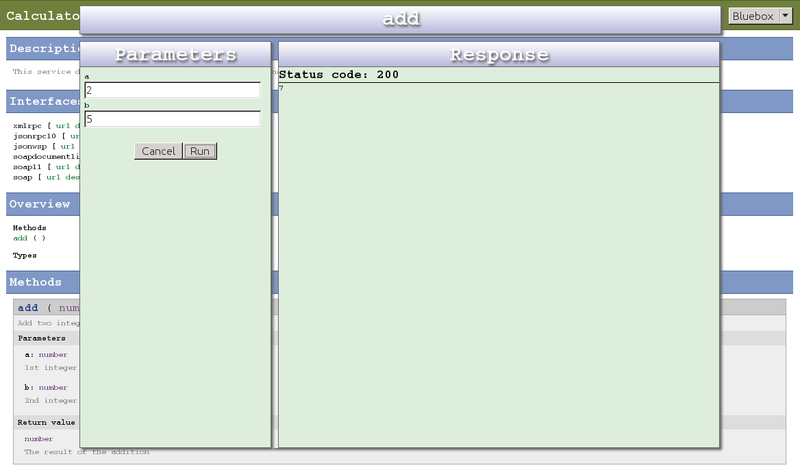 Ladon is a multi-protocol web service framework. Take your user functionality and wrap it into a plain python class which we call a Ladon service class. When your service class is in place, serve it up using Ladons build-in server or using the WSGI Wrapper application for real webservers. Take a look at Example 1 and Example 2 below to get an idea of how it works. The first example is the simplest service I could imagine, taking to integers as argument and adding them together to return the addition as the method result. Notice the ladonize decorator that defines the parameter types and the return type. This is really all you need to do to expose your method. You will see the service catalog which links to all the service classes you have exposed at this HTTP entry point. Under the “Methods” section find the “add” method and click it. This should present a dialog for calling the method. Using a browser with “bluebox” skin will call your service using the JSON-WSP protocol exclusively. It is recommended that you use fiddler, firebug or the browser’s built-in web developer tools to study the request/response flow. The second example is a bit more elaborate and shows how you can implement a web service with lists and nested types. © Copyright Jakob Simon-Gaarde. Created using Sphinx.